Here you can watch a video of a performance of it by the children’s singer/performer Red Grammer. 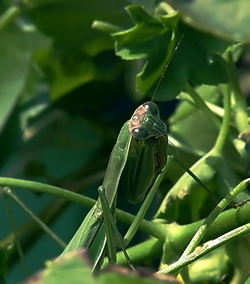 Ohh thank you for sharing this song and information about the praying mantis. They have not been one of my favorite creatures but I will now see them in a new light! 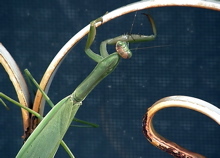 Jen thanks for stopping by – next time you see a praying mantis will never be the same. Truthfully I’ve been journeying through sorrow but I feel more than blessed to have a spiritual teacher whose presence shines as brightly as ever in my heart. thanks for the support – I just visited your photos site http://tinasu.com and the presentation of your beautiful photos is VERY nice. Seeing that you live in Seattle, have you ever eaten at the Silence-Heart-Nest Restaurant? Some of my friends work there and I hear it’s a great vegetarian restaurant. Man that’s a cool poem! Thanks for posting it, keep it up! I’m so pleased to discover your UrbanMonk personal development site through your leaving this comment. Your article on Loneliness is so powerful. I’m honored to share company with you on Priscilla Palmer’s Personal Development List.